If you have been following along with us for a bit now, you may have noticed that we like to eat out of a bowl! What is it about turning something into a bowl meal that just makes it better? Well, I’m not really sure the answer to that question, but I do believe it is true. 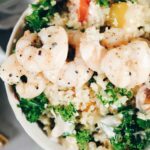 Almost everything is better in a bowl, and most definitely these Paleo cauliflower rice bowls with shrimp! Just about everything goes into a bowl in our house, with the main exception being salads or something that needs to be cut up as you eat it, like grilled steak and veggies for instance. Sooo…pretty much almost everything belongs in a bowl in my opinion. There’s just something about being able to mix things up in a bowl and get all the flavors in every bite that I love. 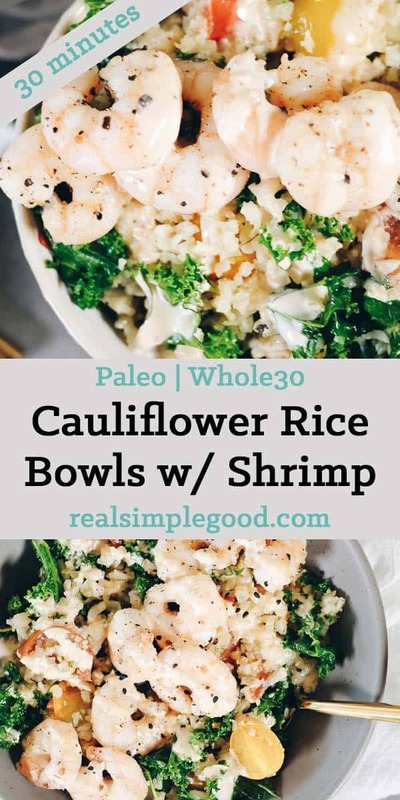 Aside from being a bowl meal, I especially love how simple, quick and easy these Paleo cauliflower rice bowls with shrimp are. They only require 8 ingredients, excluding water, salt, pepper and optional sesame seeds as a topping. And even better, you can get this one on the table in 30 minutes or less. It’s THAT easy! 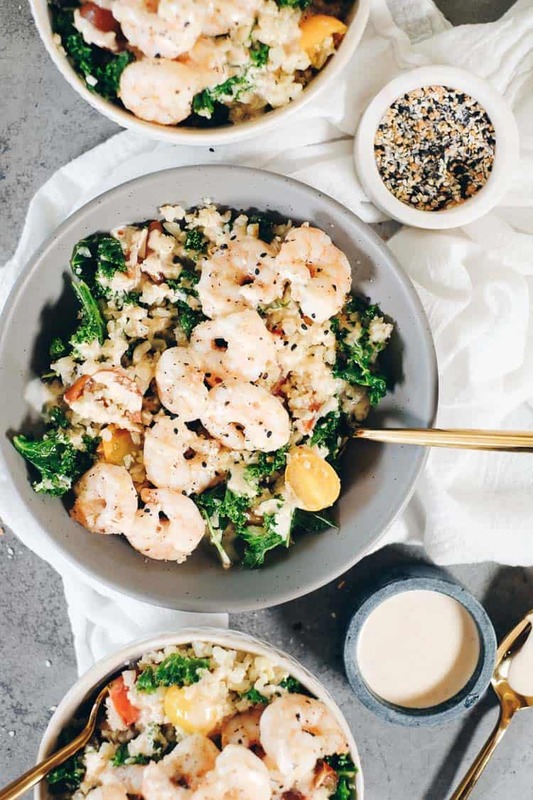 We top these Paleo cauliflower rice bowls with a creamy, dairy-freee drizzle. It’s made with only 3 ingredients – mayo, water and hot sauce. You can use whatever kind of Paleo + Whole30 compliant mayo and hot sauce you like, and you just whisk the ingredients together in a small bowl or jar. 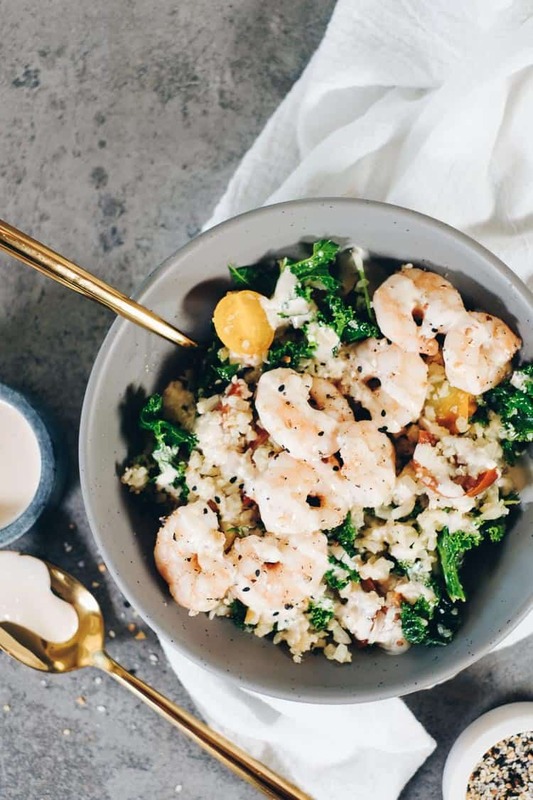 The creaminess is the perfect complement to the garlicky cauliflower rice and pairs well with the tomatoes and earthy kale. Our go-to for mayo is Primal Kitchen, and we use it most frequently. Another Paleo friendly mayo brand is Chosen Foods. There are a couple of hot sauce brands that are readily available where we live and that we enjoy. First off, Trader Joe’s has a jalapeño pepper hot sauce that has clean ingredients and is a tasty addition to lots of recipes. The other brand we enjoy is one we have found at Whole Foods and health food stores like it. The brand is Arizona Pepper’s Organic Harvest Foods. We’ve tried the jalapeño and habanero pepper sauces. The habanero one has quite a bit of kick to it! 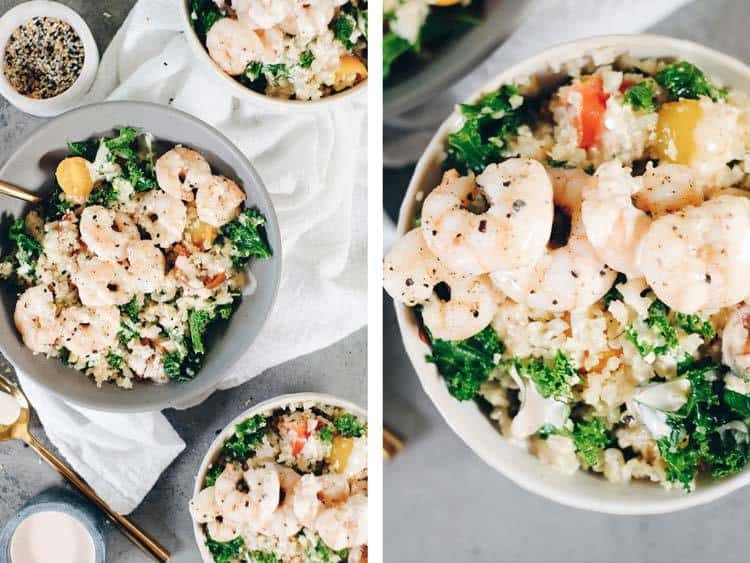 Go ahead and plan these Paleo cauliflower rice bowls with shrimp for a weeknight when you need a tasty and satisfying meal that takes only 30 minutes or less! It will be your new favorite quick and easy meal! Let us know how it goes by leaving a comment below. Also, take a photo and tag us on Instagram @realsimplegood, so we can check it out! 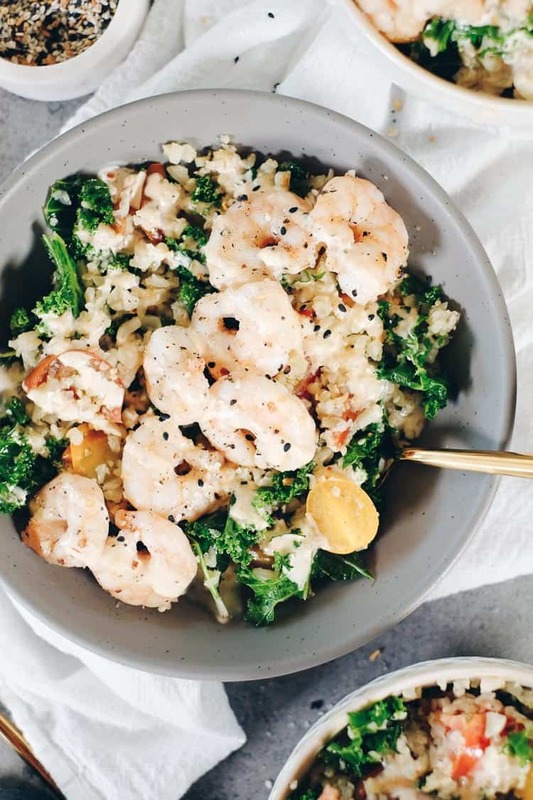 These Paleo cauliflower rice bowls with shrimp have tons of flavor with few ingredients. Plus, it's quick to make! Prep cauliflower, kale, garlic, tomatoes and shrimp as noted. In a large skillet over medium heat add 2 tbsp avocado oil, the cauliflower rice, kale, garlic and tomatoes. Stir to mix everything up. Then, let it cook for about 5-6 minutes, stirring occasionally, until the kale is wilted. Taste and season with salt and pepper as desired. Once wilted, turn down to low to keep it warm while you make the shrimp. While the cauliflower rice is cooking, make your sauce. Whisk all of the sauce ingredients in a small bowl or jar. Set aside until you serve. Heat another large skillet over medium heat, and add in 1 tbsp avocado oil. Once the skillet is hot, add in shrimp to cook. Cook shrimp just a couple of minutes each side, until pink throughout. Season shrimp with salt and pepper to taste. 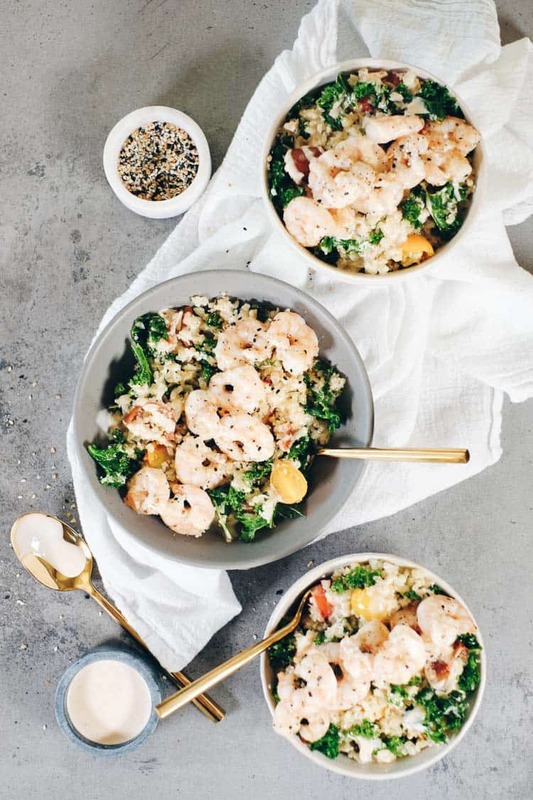 Once the shrimp is cooked, turn off all of the burners and serve shrimp over a bed of the garlicky kale cauliflower rice. Drizzle sauce over everything and add any optional sesame seeds as a topper. Enjoy!